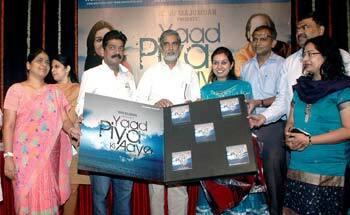 MUMBAI: Worldwide Records released Arati Patankar's debut album â€?Yaad Piya Ki Aaye' at Ravindra Natya Mandir, Mumbai. The album comprises of seven songs and is a fusion of traditional bandish and thumri. The music is arranged by renowned flautist Pt. Ronu Majumdar and the songs are vocal by Patankar. The launch witnessed the live performance by the debut artiste. The occasion was graced by the Government of Maharashtra dignitaries including cultural and tourism Department principal secretary Anand Kulkarni (IAS), Mantralaya director information and public relations Shraddha Belsare, Director of P.L. Deshpande Academy Suprabha Agarwal, Art Director Nitin Desai, Pt. Ronu Majumdar, Ravindra Patankar and many more.